John and Bonnie Ayars, 4th generation dairy farmers, started Land of Living Farm in 1972. Together with their son Lucas, they care for 75 Guernsey and Brown Swiss cows and 1,000 acres of cropland. 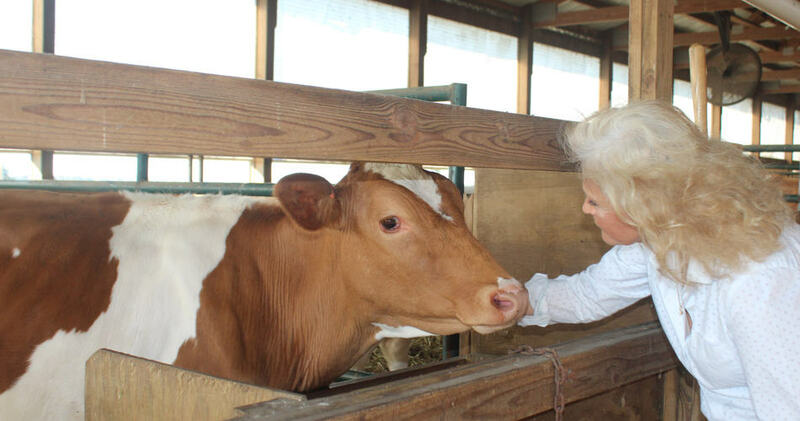 In addition to providing excellent care for their cows, they also make ice cream on-farm to sell in local grocery stores, offer farm tours and host community gatherings. How is caring for dairy cows different in the winter than in the summer? John: As the winter approaches, our routine changes. The wet, chilly air makes it harder to keep cows clean and dry, so we have to use more bedding in the barns. If there is snow in the driveways and feed bunks, we have to clear it out. And, sand or salt needs to be spread over ice so the cows won’t slip when they walk. It is challenging to keep water from freezing, and we often have to thaw the water to make sure the cows have a ready supply. We have to remember to check that milk we’re feeding to calves is warm enough because it cools off more quickly. In addition, we have to make sure there is cross-ventilation in the barns to keep air moving. What does the tradition of dairy farming mean to your family? Our tradition is dairy farming. It’s our heritage and way of life. What does cow comfort mean to you? Lucas: It gives us great pleasure to go into the barn and see that our cows are enjoying the space we have provided for them. We try to monitor each individual cow and give them the personal care they deserve. Our barns were built to keep cows comfortable year-round, and they are designed to provide a continuous, fresh water supply. We feed cows a wholesome, balanced diet that includes many feed products raised right here on the farm. Bonnie: Think about how you and I are concerned about having comfortable mattresses and making sure our beds are made. We give that same concern to the bedding of our cows. We make sure that cows have sand in their stalls, which is comfortable and absorbent, so they stay cozy and dry. And, we’re careful to make sure our barns are always clean and sanitary.